Have you heard of Audible Originals? If you’ve been around for a while, you already know that I LOVE to get my money’s worth out of whatever I’m paying for. If I’m going to pay for Amazon Prime, you can be darn sure I’m going to get my free Kindle books every month from the First Reads program. Similarly, when Audible introduced their Audible Originals add-ons to an Audible subscription, I was 100% in. First off, if you’re wondering “What are Audible Originals?” they’re audiobooks produced by Audible that aren’t available anywhere else. Most audiobooks are produced by the publishers of the books and then Audible simply acts as a marketplace for the publishers to sell those audiobooks. So if you want to listen to Michelle Obama’s memoir, Becoming, for instance, you could get it through Audible, but you could also get it directly from the publisher or through one of many other sources for audiobooks, including your library’s Overdrive subscription. Audible Originals, on the other hand, are produced by Audible themselves and you can’t get them through any other source. And, here’s where I’ve buried the lede a little – every month, Audible subscribers get two free Audible Originals. So in addition to getting to pick your one regular book with your Audible subscription from the massive Audible library, they also select 6 Audible Originals from their catalog each month and you can pick two of them for free. Folsom Untold – Even if you’re not a country music fan, you probably are at least somewhat familiar with Johnny Cash’s At Folsom Prison album which was recorded live at the prison in front of an audience of inmates. This is the story of how this album came into existence, weaving together music, interviews, and the headlines of the day. Lucky Suit – A romantic comedy about a woman who is completely over being set up with men her family, friends, or co-workers are convinced she’ll love. She decides to take her chances with online dating instead. Mala – This one-woman play is brought to life as an Audible Original and read by the the playwright about death and how humans cope with loss. Audible calls it “funny and frank” despite the subject matter. Dodge Twist – Supposedly, Charles Dickens always hoped to write a sequel to Oliver Twist, but never got around to it. So. . . .someone else is doing it for him, imagining what might have happened to Oliver and Dodger years after the original book takes place (I’d need to read Oliver Twist before I listened to this one – happily the Audible edition of Oliver Twist costs a whopping 66 cents). Sovereign – A middle grade novel about a boy in deep space tagging along while his parents search for intelligent exterterestial life who just wants to go back to a normal life on Earth. Naturally, he gets separated for his parents and finds himself stranded on a distant planet. Killer by Nature – You can be certain this is NOT one of the ones I picked this month because I plan on sleeping again sometime in my life and even the cover of this fictional psychological thriller gave me the creeps, but if you are less of a wimp than I am, this one might be right up your alley (it’s got a full-cast including the guy who played Thomas in Downton Abbey). 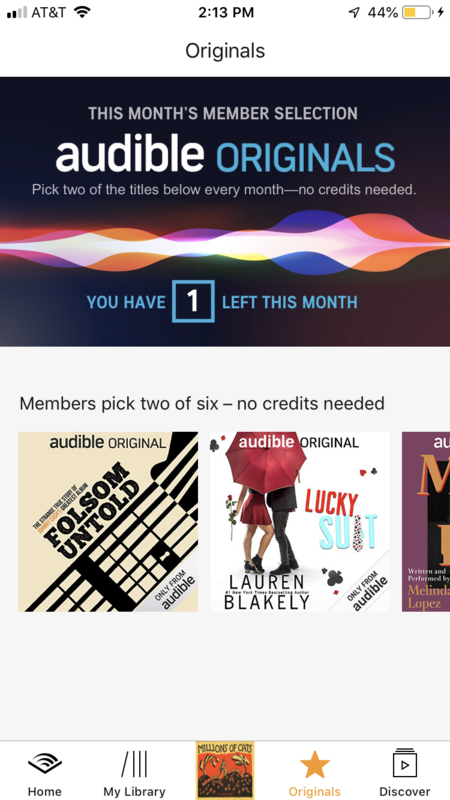 The bad news is that if you don’t snag your two free Audible Originals titles during the month, you lose the chance to get them for free (although you can always just buy them from Audible or use your monthly credit to get them later), but on the first of every month, six new options will appear and you can choose two from those. (And if you don’t currently have an Audible membership, you can sign up for a free month here and get not only one free book from their massive library but also two of this month’s Audible Originals). 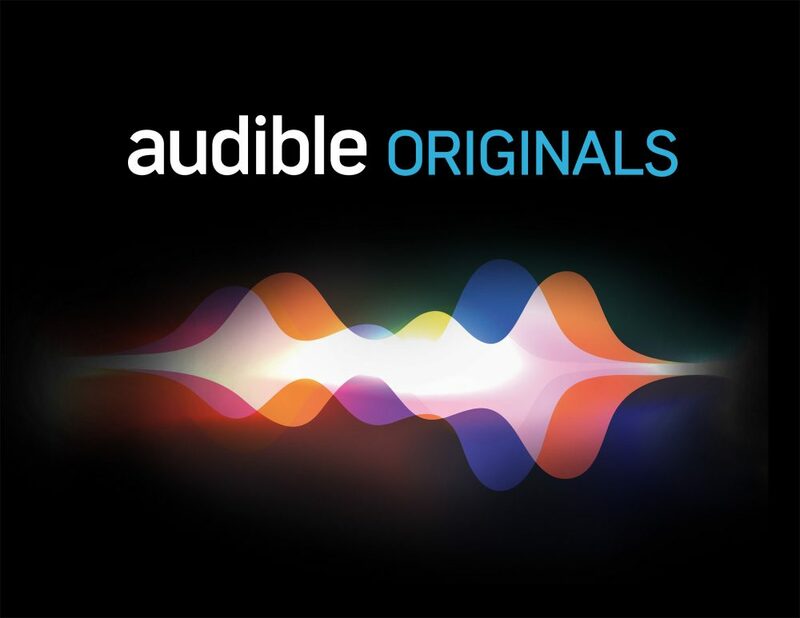 If you’re looking for each months’s Audible Originals, you can just open the app and on the bottom menu, there will be a tab called “Originals.” Tap that and you’ll see all the choices for the month and you can download your two picks right there and then. If you aren’t seeing it, you might need to update your app, since it’s a pretty new feature! Have you used Audible Originals yet? If so, let me know how you’ve liked it and what your favorite listens have been so far. thanks for this post…I’ve been an audible member for years and have never done the audible originals…I just downloaded one and am so excited…thanks again for your blog!